Bahir brings the allure of the Mediterranean to your space, melting currents of glass into balance with hue, light and shadow. Light is our craft, our art, and we’re dedicated to creating the masterpiece of your vision. 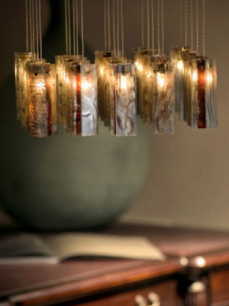 Expert artists search the world, hand picking the best and finest materials for custom lighting your way. No matter the size, no matter the space, you are guaranteed one of a kind perfection. Even though our pieces are found in both residential and commercial spaces around the globe, there is no signature Bahir style. Our lights feature incredible quality and beauty. The right lighting can change a space and add beauty to every aspect of the home;. Come to the warm and stunning showroom in the International Market Square in Minneapolis, hand select a piece among the vibrancy, the dynamism that is the Mediterranean, then tell us your perfect light-scape. Our dedication to every hand crafted detail is to ensure quality, perfection and your lighting visin. Fill your space with the beauty of Bahir Lights. Lighting is our passion. Let our passion light up yours.